It was a busy summer here at Peppermint Ridge as we’ve moved from monthly events to fortnightly lunches on the 2nd and 4th Sundays of the month (come visit us)! Our native garden is flourishing and we love this time of year as the lemon myrtles are flowering, giving the bees a lovely nectar meal to feast upon. But this year has been particularly special as we are also seeing our first fruit from our Davidson’s Plums and our blue quandong has a massive fruit set that is swelling fast. We’re also starting new projects, like this one: drying the seed heads of the Lomandra longifolia (spiny headed mat rush, basket grass). Lomandra longifolia was very useful plant to aboriginal people; they used the leaves to make fine baskets and the seeds to make flour. We’re hoping to have a go at making flour using the seeds. The seeds are inside the yellow casing and are as large as a grain of rice–it should grind up easily! Want to have a go at it yourself? Here are our tips for growing and harvesting the seeds. Tip 1: Cover the seed heads with an old pillow case to catch them as the casing pops open. Will let you know how the little cakes taste when we make them. Tip 2: Lomandra longifolia is dioecious so you will need 1 male plant to several females to get any seeds. And if you’re interested in making baskets using this amazing native plant, come along to the Basket Weaving workshop at the farm on April 1. Aboriginal artist Cassie Leatham will be using the leaves of this plant to make the baskets and share her knowledge with you. Autumn is my favourite time of year at the farm as the days are mild with light soaking rain and the weather very settled. The light seems different and the slanting afternoon light is wonderful viewed from the terrace. The bush food garden is looking its best and with all three layers now well grown and lush. Cropping has been good so far – we have started to pick the red finger limes and the green ones will follow when they are fat enough. I plan to use these wonderful fruits in a variety of ways. Some of my favourites are to make a finger lime curd with our fresh eggs – we will team this with maybe some lemon myrtle pannacotta or freshly baked meringues with a marshmallow centre or use it as filling for fresh vanilla cupcakes – all delicious. Fingerlime cheesecake is also wonderful – the red zest gives a very interesting addition to the dishes. The Mountain Pepper berry crop is ready for harvest too and each year the number of berries increases. A good thing too because their flavour is quite unique. We dry them slowly and then grind them in a pepper grinder fresh for each dish or use them whole in a sauce to steep the pepper flavour. The leaves are also full of that hot pepper taste all year round. I like to grind them with lemon myrtle leaves to create a lovely herb crumb. Tonight I rubbed that mix into a leg of lamb and slow roasted it for a few hours – quite delicious. The berries will keep in a jar for a long time – that doesn’t happen here as we like to use them in dishes too often. Be creative in your own kitchen with these wonderful plants. Having your bush food garden and eating it too! enjoying watching all of the fruits fatten and the edible leaves glowing. The anise myrtle has a particular secret. If you eat the the new red leaves you will discover they taste like a soft sweet licorice lolly but without the sugar – bonus. The mature leaves are high in antioxidants, vitamins and minerals so perhaps the immature ones have some of these properties too. The mature leaves make a wonderfully refreshing tea as well as great ice cream. One of my interests is in encouraging gardeners to add bush foods to their flower and vegetable gardens. This year we have watched the growth of the finger limes, native blueberries, midyim berries, native currants and pepper berries and continue to propagate these in our bush food nursery. Some of these fruits have very high nutritional qualities – the currant has very high levels of vitamin C, the pepper berries are high in antioxidants, vitamins and minerals. Not all of the fruits have been tested by food scientists, but anecdotal evidence of the native blueberry discusses upset stomachs from eating too many of them. This could be due to a high level of nutrients or a presence of toxins, so caution in eating untested plants is always advised and never go eating fruits or leaves on forest walks as some plants are proven to be toxic (always buy your edible native plants from a reliable and knowledgeable source). Not only do the tested fruits taste wonderful, the plants are very attractive additions to garden design. These plants are easily grown organically as they are not susceptible to attack by fungus, bacteria or insects – this is from 16 years of trials here. Some plants need a little protection from strong hot & cold winds and dry soil such as the Mountain Pepper and Lemon Myrtle, bit most are tolerant of tough conditions. It is a lot of fun making up new recipes for these wonderful plants, and over the Christmas break we made up a new recipe for our macadamia, salted caramel and chocolate tarts. The new base is a bit softer and has a lovely chewy texture which we think is a great improvement on the original recipe. The whole eating experience is one of a toasted macadamia biscuit base, a soft gooey salted caramel centre and a crisp dark chocolate topping. This recipe will feature at our next cooking school class next month. Copyright © 2015 Julie Weatherhead, Peppermint Ridge Farm. All rights reserved. At Peppermint Ridge Farm we are passionate about Australian native foods and spices. We run bush food cooking classes, tours of our Australian Spice Garden, and foodie events on site in Tynong North, Victoria. We are also available for private functions. Find us on our website: www.peppermintridgefarm.com.au. This new summer rain has given a great growth boost to our bush food plants. We will have a great crop of finger limes and mountain pepper and the new anise myrtle plants are growing fast in their pots. I have been experimenting with grinding up the fresh leaves of our native herbs with salt and garlic, ginger would be good too – even better to use the native ginger. These ‘herb crumbs’ spice up any dish. 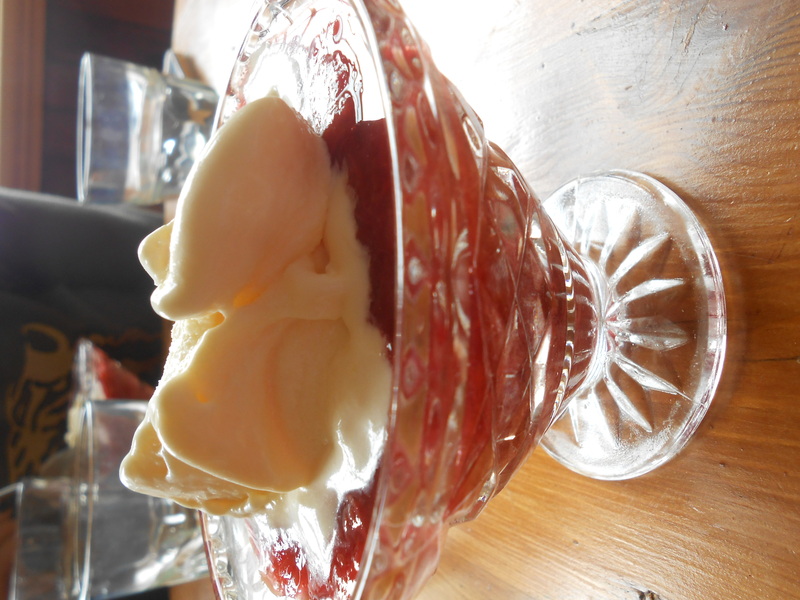 We are doing a lot of experimenting and love anise myrtle – have made an amazing ice cream with it that we teamed with our own strawberries and rhubarb poached in pomegranate juice. Last week we marinated pork belly with anise myrtle before slow cooking it – the result was amazing – it creates quite a different flavour. That’s the thing about bush foods, the flavours they produce are hard to describe because there is often nothing to compare them to. Strawberry gum is a good example – the oil in the leaf smells a bit of strawberry, passionfruit and vanilla – quite unique. But when you team it with your favourite dishes it creates whole new wonderful flavours that defy description. Try it and let me know if you agree. Here at Peppermint Ridge we are thinking about how to create a Christmas lunch for our family that is spiced with Australian flavours, we will then carry that on to creating a truly different Australia Day lunch on Monday Jan 26 as our first event for 2015. I think the finger limes should be great marinating fresh salmon and we love creating fresh sorbets with them. Have a look at some shots I have just taken of some of our crops that are growing fast – finger lime and mountain pepper. 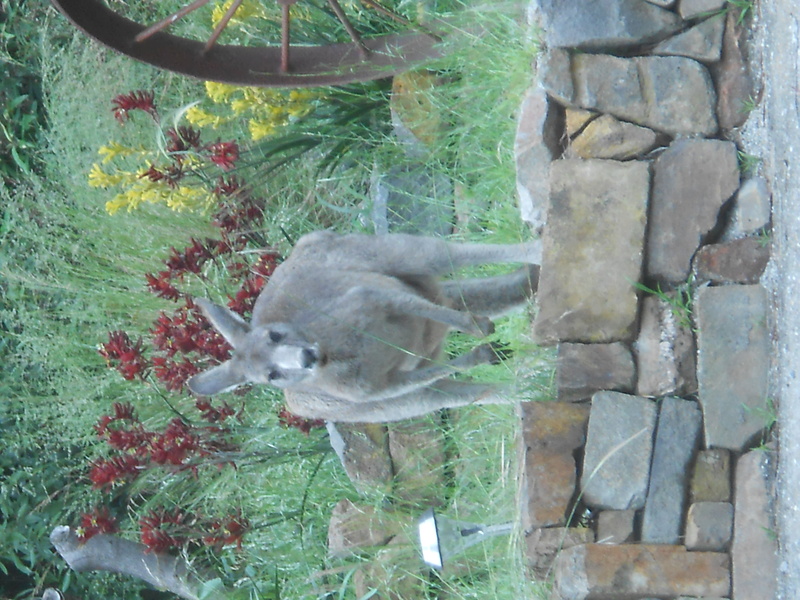 I have added a pic of our kangaroo family that doesn’t mind coming up close to the house. Copyright © 2014 Julie Weatherhead, Peppermint Ridge Farm. All rights reserved. We are always thinking up new ideas here at Peppermint Ridge for using bush foods to encourage others to put these wonderful plants in their gardens. We know that as soon as we increased the diversity of plants in our gardens the diversity of native animals and insects increased too. We now have an exciting array of native birds and animals that visit every day. The dishes that can be prepared from these plants seem to have no end and we have put together some new ideas for the cooking school here on Saturday November 15. I hope that these ideas will encourage you to have a go yourself. As we have many people visiting who cannot have gluten we have been experimenting with that issue and found that bush foods accommodate very easily into gluten free dishes. Desserts will be Native Finger Lime Curd tart and our very popular Anise Myrtle Ice Cream (GF) with rhubarb and strawberries poached in Anise Myrtle leaves and pomegranate juice (GF). What we really enjoy is growing most of the ingredients for these dishes in our gardens and we will pick them at the start of the class- you can’t get any fresher food! The Finger Limes have finished flowering and the tiny fruits are starting to swell. see the pic attached of them in flower. They are a unique Australian Microcitrus and very delicious. We mustn’t forget that one of the tastiest nuts is the Australian Macadamia – the trees will fruit in Victoria even though it is a tropical zone tree. Another wonderful sweet treat is the crunchy Macadamia, salted caramel and chocolate tarts that we have been making for visitors. Welcome to the new Bushfood Blog! Hello from Peppermint Ridge Farm! We’re delighted to begin our first ever blog about bush foods. We’re passionate foodies and have grown and cooked with bush foods for more than 15 years.